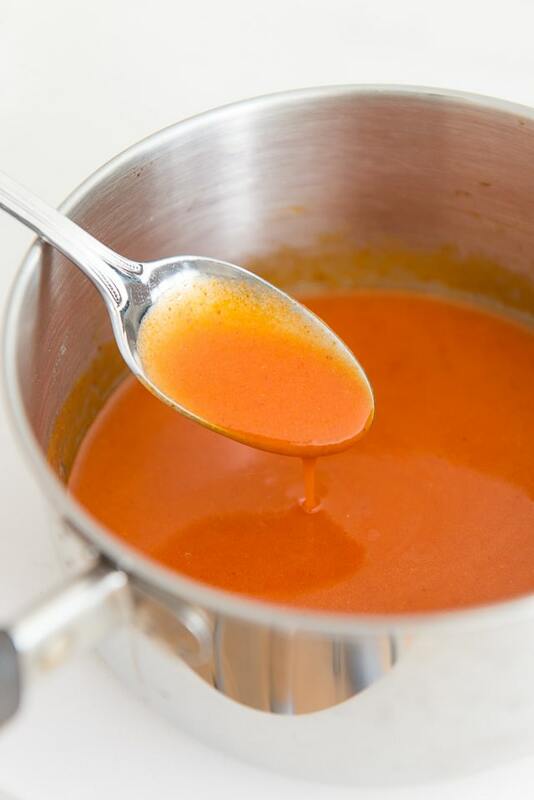 This Buffalo Wing Sauce has the perfect balance of flavors and a smooth consistency. It’s easy to make and excellent for tossing with fried or baked chicken wings. When you grow up eating Buffalo Wings every Sunday for your entire childhood, you really get to know what the perfect sauce tastes like, and this is it. And no, I’m not talking about me (I’m from California), but rather about my husband Pete, who is an Upstate New York native. He really knows his stuff when it comes to wings. 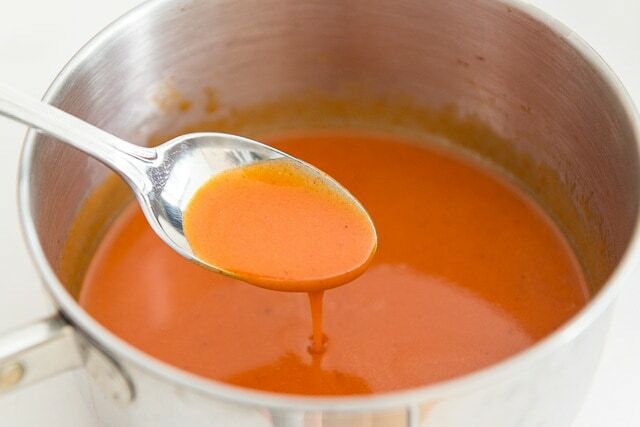 Even though buffalo sauce only has four ingredients to it, the balance is essential. 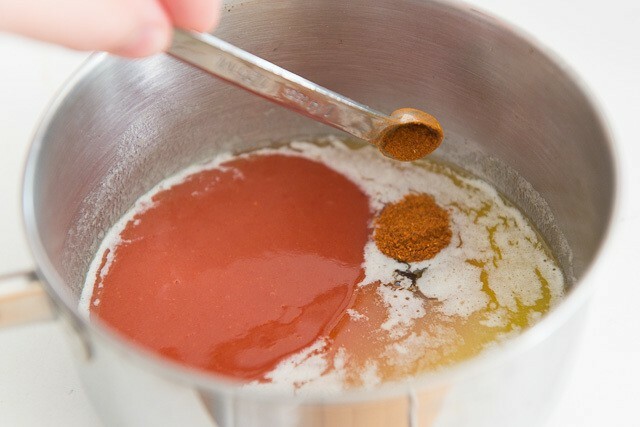 For example, Pete taught me that you don’t want to add more Frank’s sauce when you want spicier wings, but rather, you want to add ground cayenne pepper. Frank’s is spicy and cayenne-based, but it also has a ton of vinegar in it that’ll make the sauce too tangy. It can easily throw off the balance. This Buffalo Wing Sauce has a luscious, smooth mouthfeel that coats the wings really nicely, and has the right amount of spiciness and tang to it. 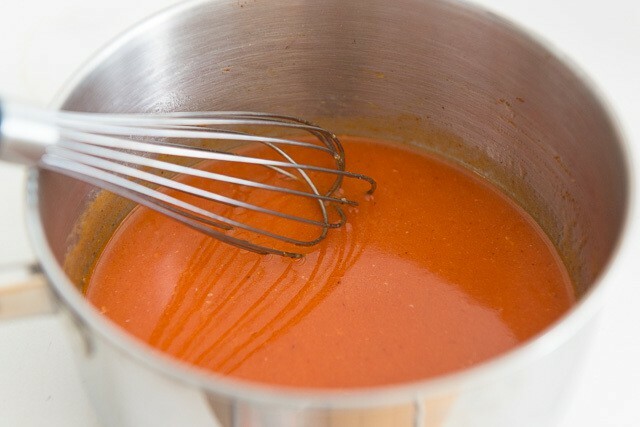 A good buffalo sauce will coat a spoon and have a slight thickness. That way you know that it’ll coat the chicken wings beautifully too. You can also melt it in the microwave instead, if that’s easier for you. When you want more heat, always add more ground cayenne pepper instead of extra Frank’s sauce. Otherwise you’ll throw off the balance of acidity. Now it’s ready to be tossed with freshly fried or baked chicken wings, and served with homemade Blue Cheese Dip! If you haven’t tried chicken wings baked instead of fried, it’s one of my most popular recipes since 2012 and many people like them more than fried wings. 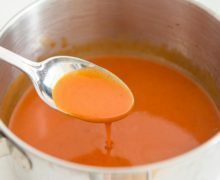 One more note on the sauce: it will change in consistency as it cools off, because butter tends to firm up as it chills. 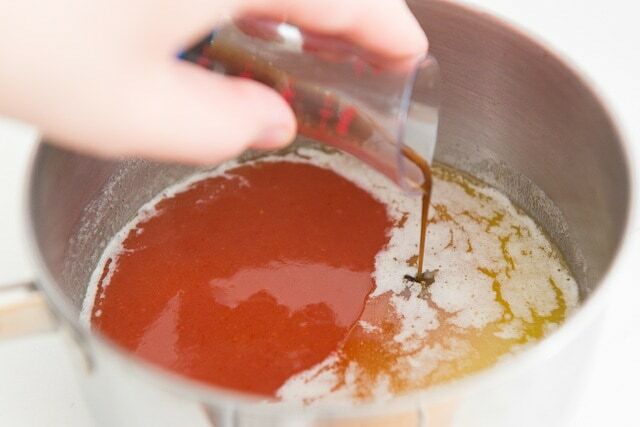 For that reason, we make the sauce while the wings are cooking. You can reheat it as needed. Can you make buffalo sauce ahead? Yes, just reheat on the stove or in the microwave and whisk together to combine. Also, we don’t add any salt to the sauce, as there is a substantial amount in the Frank’s. But you can adjust to taste if you’d like. For more Buffalo Recipes and Game Day food, this Buffalo Chicken Dip is another favorite (here’s the crockpot version: Crockpot Buffalo Chicken Dip). For something a little different, try Buffalo Chicken Pizza or Buffalo Chicken Fettuccine. Enjoy! 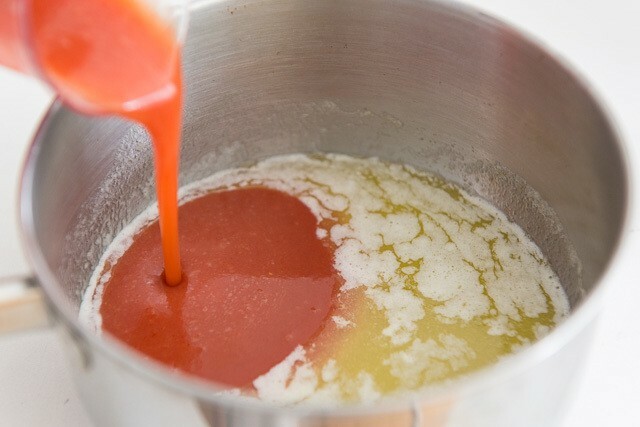 A perfectly tangy, spicy, and smooth buffalo sauce to coat freshly fried or baked chicken wings. 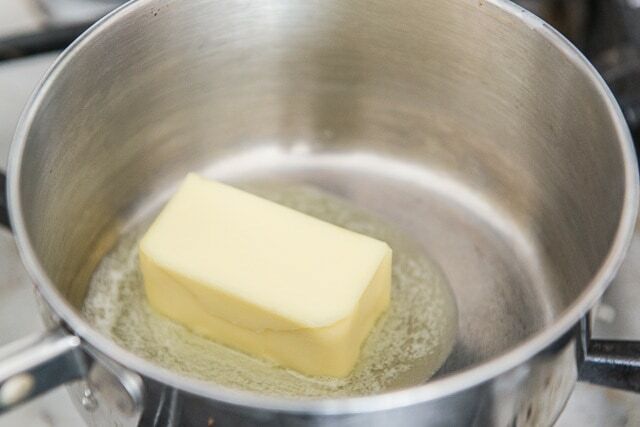 Melt the butter in a saucepan or in the microwave. Add the Frank’s hot sauce, worcestershire sauce, and cayenne pepper. Whisk to combine. Taste the sauce and add more cayenne pepper if you want it spicier. Enjoy! Post updated in August 2018 with more writing and tips. Originally published January 2017. 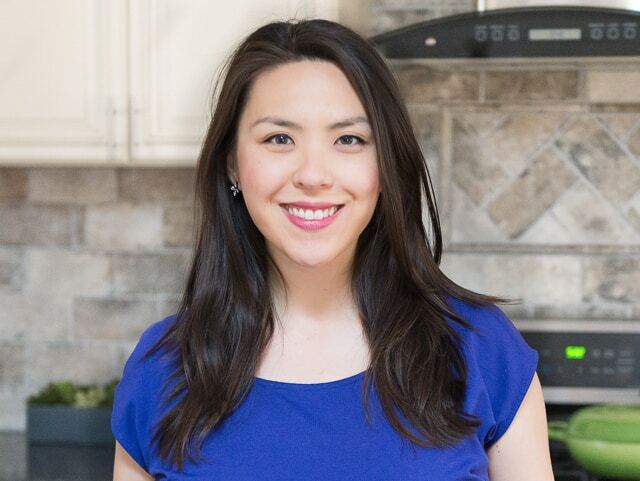 All Recent Posts, Chicken & Poultry, Gluten-free, Sauces, Spice Mixes, Dressings, etc.